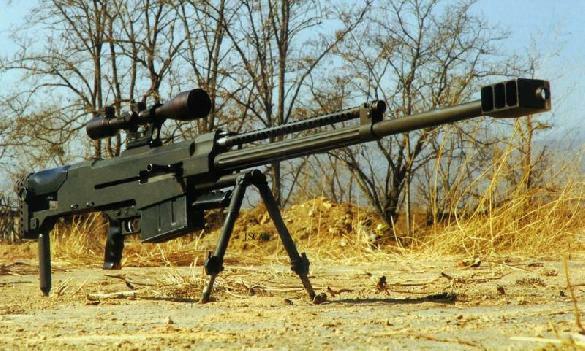 12.7 x 108mm caliber Length: 1480 mm Weight: 12 kg Effective Range: 1500 m Cyclic Rate: 800 m/s Magazine Capacity: 5 rounds Sights: x8 x10 The M99 semiautomatic sniper's rifle is the new stereotypia export model counter- equipment rifle, this gun just when made an appearance,was very easy to let human's think it deeply had the origin with English AI Corporation's AS50, two contours approached as if very much, blew the type principle for the gas, outside the airway all had to separate the hot jacket protection in particular, place above prevented the airway heated up the air but to affect the aiming. But if carefully contrasts, can discover M99 and AS50 only are partial similar, may distinguish actually contour characteristic very many, but the internal structure difference were more, resembles AK47 and Vz58 is same. The M99 interior resembles the enlargement M16, the rotation type rifle bolt block system; But AS50 then likes the enlargement FAL or SKS, by reduces the radial direction size with the displacement type block system. The M99 engine case looks like must be thicker than as if AS50, but this is because had to prevent the gas pollution rifle bolt but to lengthen the airway to after, on the rifle bolt frame increased a part, wrapped up the airway terminal not to appear externally in the entire rifle bolt travelling schedule, this was behind the engine case appears the high reason. In addition the engine case is a bulk aluminum alloy cold finishing but becomes, volume inevitably big, but in the weight, M99 wants AS50 to be lighter than actually 2kg."